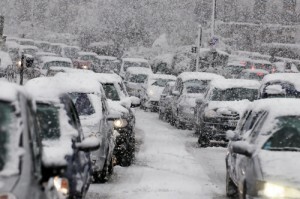 For both new and experienced drivers driving during the winter brings about many challenges. A little preparation for your car during the winter will go a long way, but altering your driving habits will help to keep you safe while driving during the winter. Don’t Use Your Cruise Control – While it may be second nature to flip on the cruise control when driving, it’s best to skip it when driving during the winter. If you have the cruise control on and you hit a patch of ice or hydroplane it can cause the vehicle to accelerate while trying to maintain a constant speed and you could potentially lose control of your car. Defogging Your Windows – Sometimes it’s hard to keep your car windows defogged during the winter and if nothing is working try turning on the AC and that will clear the windows right up. A less desirable fix would be to crack the window making the temperature in the car the same as the temperature outside which will also get rid of the fog. Take Your Time – While it may seem obvious that you need to take your time when driving during the winter it isn’t always what happens. Give yourself extra time during the winter, especially during inclement weather. Drive With Caution – Avoid accelerating and decelerating quickly during the winter. Even if you have a four-wheel drive vehicle take your time speeding up and slowing down to help with traction and reduce the chances of losing control. You’ll also want to leave more space between yourself and the other cars on the road. Keep Your Gas Tank Full – When driving during the winter it’s best to keep your gas above half a tank. If you break down and need to keep the engine running to stay warm you’ll be glad you weren’t on empty. Turn Into the Spin – If you lose control of your car and start spinning to regain control you need to turn into the spin. While it’s very counter-intuitive you need to turn your steering wheel towards where your back tires are going. Your instincts will tell you to hit the brakes, but don’t, instead, try gently accelerating. Doing that will redistribute weight and help to bring you out of the spin. Don’t Forget Your Emergency Kit – Every vehicle should have an emergency kit when driving during the winter and if you aren’t quite sure what should go into it you can review our recent article on the subject. Top Driver’s drivers education courses cover how to drive during the winter months. Our highly trained driver’s ed instructors will make sure your teen is prepared for bad weather. Sign up for one of our courses today. This entry was posted in Top Driver Blog and tagged Car Safety, Driver Education, Driver School, Emergency Kit, How To, How to Drive a Car, Road - Side Emergency Kit, Road Safety, Safety Tips, Winter Driving.